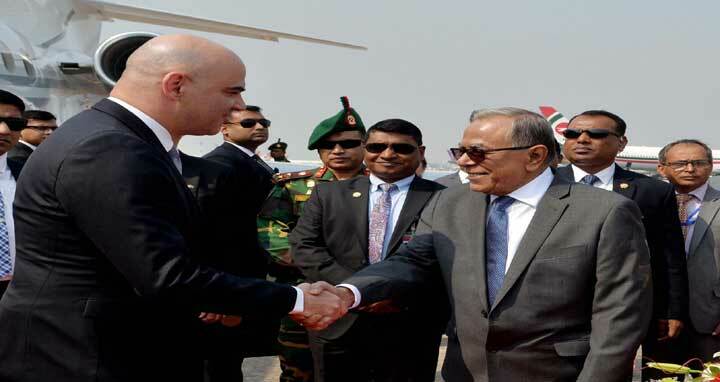 Dhaka, 4 Feb, Abnews: Bangladesh today rolled out the red carpet to welcome Swiss President Alain Berset who arrived here on a three-day official visit to "express solidarity with Bangladesh severely affected by the crisis in neighbouring Myanmar". President M Abdul Hamid and senior ministers received the Swiss leader as a 21-gun salute heralded his arrival at Hazrat Shahjalal (R) International Airport. Two children presented bouquets to Berset as he along with his entourage members alighted from a special aircraft of Swiss Air Force. The craft touched down the airport at 1:12 pm. Finance Minister AMA Muhith, Commerce Minister Tofail Ahmed, Agriculture Minister Matia Chowdhury, Foreign Minister AH Mahmood Ali, Cultural Affairs Minister Asaduzzaman Noor and State Minister for Foreign Affairs Md. Shahriar Alam accompanied President Hamid in receiving his Swiss counterpart. Cabinet secretary, principal secretary to the prime minister, foreign secretary and secretary to the President's office, dean of the diplomatic corps, chiefs of the three services and inspector general of police (IGP) were, among others, present. Bangladesh President escorted his Swiss counterpart to a makeshift dais and the national anthems of two respective countries were played then. Subsequently a joint contingent of army, navy and air force offered him an honour guard. After the ceremony, President Berset left the airport for the Pan Pacific Sonargaon Hotel where he will be staying during his visit, according to the programme schedule. It is the first time a Swiss president is visiting here since March 13, 1972, the day when Switzerland recognised the independence of Bangladesh. The aim of the visit is also to establish "closer bilateral relations" between Switzerland and Bangladesh, according to a Swiss embassy statement issued here earlier. Berset's official engagement will begin amid a meeting with Foreign Minister Abul Hassan Mahmood Ali at 6 pm today. The Swiss President will lay a wreath at the National Memorial in Savar tomorrow morning to pay homage to 1971 Liberation War martyrs. Later, he will visit the Bangabandhu Memorial Museum at Dhanmondi and lay a wreath at the portrait of Father of the Nation Bangabandhu Sheikh Mujibur Rahman to pay respect to the memory of the greatest Bengali of all times. During the visit, Berset will hold official talks with his Bangladesh counterpart M Abdul Hamid at 7 pm tomorrow. Earlier, he will also have a meeting with Prime Minister Sheikh Hasina at 3 pm. During the official talks, the two countries will discuss ways to further strengthen economic and cultural cooperation along with underscoring the current status of bilateral relations. "Solidarity with Bangladesh in the Rohingya crisis and cooperation in multilateral fora will be the major focus of the talks," the statement added. On Tuesday, Berset will visit the Kutupalong Rohingya camp in Cox's Bazar district. Switzerland is providing humanitarian aid to the forcibly displaced Myanmar nationals, who fled to here from their Myanmar's Rakhine state homeland since last August being the worst victims of military crackdown there. During his stay in Bangladesh, the Swiss President will also meet members of the civil society, Swiss businesses active in Bangladesh, and will visit Dhaka Art Summit of which the Swiss Arts Council Pro Helvetia is a partner.